Share our Facebook page for 15% off your purchase for Mothers Day. 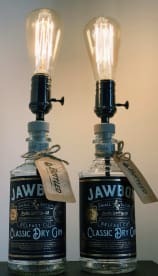 BottLED based in Bromsgrove, Worcestershire a unique range of up-cycled lamps and lights with other quirky products that will compliment your home interior design, which sets us apart from all of the usual kind. We offer a range of services which you may find of use and difference for your wedding or event. All our pieces are equally popular, and are for all sorts of special occasions and even your home interior. We can work from photographs, or from a reference pictures, or even from an idea or even a existing product you wanted turned into something truly unique. We can work in traditional or modernist styles, and our affordable prices mean that everyone can have a bespoke made piece. If you're looking for something unusual and bespoke, let us do the thinking for you. We work with a range of different materials suitable for indoor or outdoor, so whether it's a statement piece for your home or a gift for a special occasion, we can work to most budgets and provide a one of a kind piece that will be a talking point for many years to come. If you're looking for a very special gift for an anniversary, birthday, wedding or other special event, then why not consider a bespoke Bottled product? With Bottled, we can produce a beautiful custom-made piece just for you. We offer all types of bespoke pieces, so there really is something for everyone, we don't just use bottles, we incorporate other materials. These create some awesome stuff! I would defiantly recommend. Very helpful people. Please note that BottLED may not be able to honour booking requests made.